When the Cursed One was awoken, it destroyed all civilization. The survivors now live under the cruel protection of the Commander. When Rachel's father, Jared, doesn't return from a courier mission on time, he is pronounced dead. Rachel hasn't given up on him, and neither has Jared's young and handsome apprentice. They know he's not dead, and they are willing to do anything to get him back. I actually checked this book out from the school library. It has been on my to-read list for many months, but my public library has yet to purchase it! When I saw it, I snatched it up, so I could be sure to read it before my sister. Haha, Allison! Who gets to read something first for once?! Me!!! From the beginning, this book really drew me in. 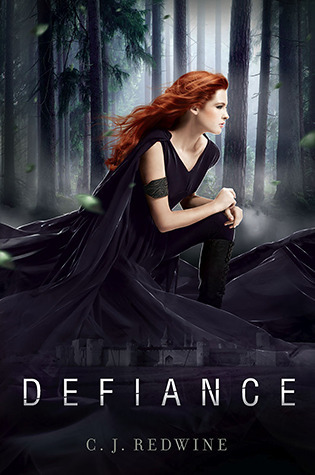 Sometimes the exposition seems to take forever in dystopian books, but I thought Defiance was a fantastic attention grabber. I thought the pacing was very fluid. My favorite character was Logan. I knew I liked him the first time I was introduced to him. He was everything a hero should be: smart, kind, and very likable. Too bad he wasn't the main character. I didn't like Rachel at all. She wasn't particularly horrible or anything; I simply didn't like her as a person. She was always making stupid decisions. I saw a certain plot twist heading Rachel's way, and I was exasperated because I thought Rachel's was going to make a frustratingly cliché mistake. I promised myself that I would stop reading if this were to happen. Good news: it didn't! However, she did do some pretty annoying stuff after that. I don't think everyone will hate Rachel. Sometimes characters are a hit or miss for certain people. Rachel isn't rant-worthy, but I still dislike her. I did like the plot. I thought the storyline was very inventive and quite interesting. My only complaint is that the Cursed One wasn't more scary. Bring on the horror! I think the author missed out on a lot of drama by not making the beast more terrifying. The potential was certainly there. I really hope it doesn't seem like I had nothing good to say about this book—I really enjoyed it. There were only a few very minor problems I had with it. This book was really worth the wait. I recommend it for a quick and easy read. When I read reviews on this book, I always think about buying it or not. Maybe I'll just borrow it from my local library like you did. I've wondered about this book, I've seen mixed reviews, but you've made it sound pretty good! I wish my library had more books to check out, but I can't seem to find any that I am looking for. I haven't actually heard of this one before. I understand liking other characters better than the main one. I actually have a meme for it because I tend to like side characters better. I'm glad the plot surprised you and didn't go the cliched way you thought it would. I enjoyed the review :D Jaclyn @ JC's Book Haven. I want to check this book out as I have heard great things about it!